It’s a well-known fact that street gangs all know martial arts and/or a highly choreographed dance scene. In the future that’s no different, except they also all do parkour and are cybernetically enhanced. Welcome to the future. Welcome to Bonehead. Bonehead was created by Rajaya Yogaswara, aka Machine56, as an art/fashion project, creating these bonehead helmets and some amazing clothing. Years later The Bonehead Project got another kick with Image Comics’ Bonehead comic. 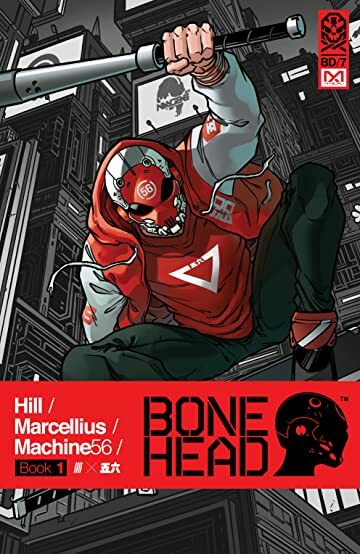 Written by Bryan Edward Hill, with art by Rhoald Marcellius, and colors by Sakti Yuwono, Bonehead vol 1 collects the four issues that were released.